Thoughts from Polly's Granddaughter: Should You Trust the Testimonies in the 1896 Applications? Should You Trust the Testimonies in the 1896 Applications? Pay attention to the number of times the name Sally/Sallie Hughes is mentioned and how many times she is mentioned as Cherokee. Did you see it? One, and I say ONE, mention of Sally Hughes, which may or may not have been the correct name of Stark Mhoon's mother. Since William Green never knew Stark's mother, he could have easily confused the names Susannah and Sally. He also could have seen the 1835 roll and assumed Sally was his ancestor or he could have intentionally picked that name, knowing it was not his ancestor, but assuming no one could disprove it. Whatever the reason, as shown by the information posted yesterday, it seems William Green Mhoon was probably mistaken on the name of his father's mother. 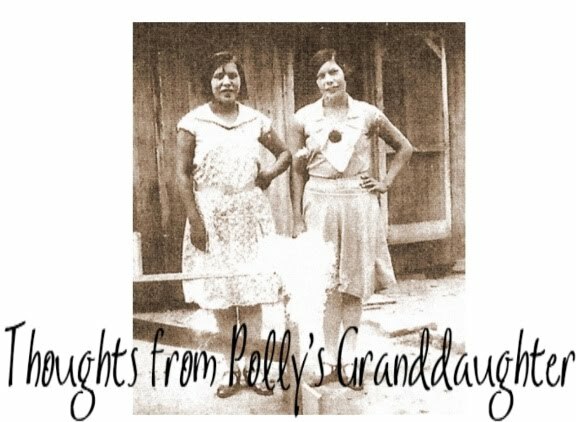 If you missed it, the one mention of "Sallie Hughes" is on the third page down in the posted application and says this at the bottom of the page, "I knew nothing of my Fathers family except that his Mother was Sallie Hughes and was a cherokee." 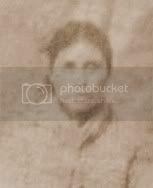 That is the ONLY mention of a woman named Sally Hughes and the only mention of that Sally being Cherokee, yet despite the fact that no other documentation supports this statement as true, the descendants have accepted it as true. That was a big mistake. Genealogy is based on documentation, not assumption. Per the History of Benton, Washington, Carroll, Madison, Crawford, Franklin, and Sebastian Counties, Arkansas. Chicago, IL, USA: Goodspeed Publishing, 1889, William Green Mhoon was of German descent and there was no mention at all of any Cherokee ancestry. 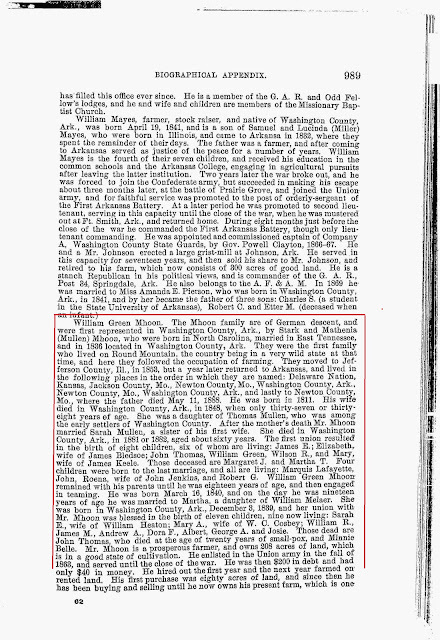 Notice the date they first moved to Washington County, Arkansas - 1836. Per much of the testimony given in the 1896 application, the Mhoons stopped in Washington County when the Cherokees were being moved. Excerpt from the Lucy Trammel testimony which is similar to many others. "...was a Cherokee Indian and resided with the tribe in the old Eastern reserve and came here with the Cherokees as they were being moved..."
This is where we can show the testimonies were not based in truth by comparing them to historical fact. Stark Mhoon's family moved to Washington County, Arkansas shortly after it was opened up to white settlement and when there was an influx of whites to the area. This is land that was taken from the Old Settler Cherokees, thus, those who settled there benefited from Cherokee oppression and why it is an insult that the descendants of those early settlers would now claim to be Cherokee. "The county was formed after the Cherokee were removed and the area was deemed safe for white settlement. 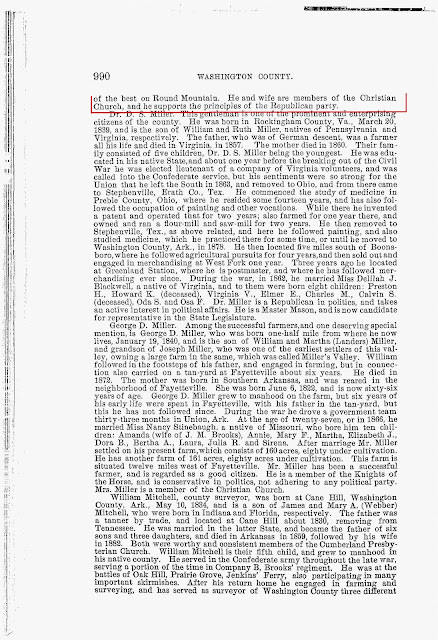 History records the names of several white pioneer families who settled in what is now Washington County, among them Alexander, McGarrah, and Simpson. The first white families came to Washington County about a year before the Arkansas territorial legislature opened the area to white settlement, thus making trespassers of the new pioneers. These squatters lived on their homesteads, anticipating quick federal intervention to gain the land from the Cherokees, making it possible for permanent white settlement. [emphasis mine.] The land formally became available to white settlement in 1828." Also worth noting, based on history, Stark Mhoon and family moved to Washington County, Arkansas two years before the forced removal of the Emigrant Cherokees started. Those Cherokees were moved from 1838-39, therefore the Mhoons could not have stopped in Washington County in 1836 when they were being "moved with the Cherokees"! It is clear, they were NOT being moved with the Cherokees when they settled in the area as the testimony given in this 1896 application says. "came here with the Cherokees when they were being moved..."
Notice people are giving testimony saying they knew a Cherokee woman (Betsey Sutton, not Sally Hughes) who lived in the domain of the Cherokee Nation and said they knew she was listed on the roll? Interesting that these people didn't live in Cherokee domain, isn't it? Exactly how did they know this woman, know she was listed on a roll, and know she moved with the Cherokees? Makes you think something fishy was going on, doesn't it? Perhaps these people testified to this because it is what the lawyer told them to say. Or perhaps it is because they were just trying to help a friend. Or, perhaps it is because they knew if William Green Mhoon's application was accepted, their application would be as well. Sarah Bledsoe, one person who gave testimony for Mhoon, also made an 1896 application through the same ancestors, so her motives are suspect as having an interest in the Mhoon application being approved. No matter the reason, we can show the testimony given is not true based on known historical facts. One might ask, is it possible William Green Mhoon filed an 1896 application knowing he wasn't Cherokee? I guess that would fall upon the character of Mhoon and his family. Were they upstanding citizens? Could their word be trusted? Stay tuned for more as we look at some documentation that gives us insight into the character of the William Green Mhoon family! This is just another case where you really need to research ALL angles and then accept the results whatever they are. They may prove what you wish and then they may not. The 1896 Apps should NOT be taken at face value as the truth. They are not without errors. You should always do further research to substantiate them. It may not be what you expect. But be proud of who your are no matter who your ancestors are. I am just starting to look into my father's Native American ancestry. Apparently we are ancestors of Stark Mhoon, William Green Mhoon and Martha T. Mhoon. This article certainly makes me feel uneasy. I have a roll number & was able to prove my Native American Heritage on my mother's side with no problem . If anyone knows of any more articles regarding these Mhoons please post.